On Saturday the 13th and Sunday the 14th of October, the feast of the Protection of the Most Holy Theotokos, His Grace, Bishop Nicholas of Manhattan, visited Holy Virgin Intercession Church in Glen Cove, NY, where he led the divine services in honor of the parish’s patronal feast day. 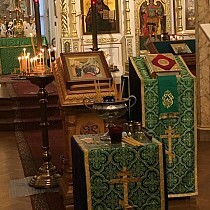 On Saturday evening, the vicar of the Eastern American Diocese led the All-Night Vigil, co-served by parish clergy: the rector, Archpriest Alexandre Antchoutine, Abbot Photius (Oulanov), and Deacon Serguei Mikhailov; clerics of the neighboring St. Seraphim Memorial Church in Sea Cliff, NY: the rector, Archpriest Serafim Gan, and Protodeacons Paul Wolkow and Eugene Kallaur; and Abbot Eutchyius (Dovganyuk; cleric of St. Gregory the Theologian Church is New York City). Singing at the service was a mixed choir of parish singers and choristers from St. Seraphim Church. The following morning, the greeting of Bishop Nicholas was held. Prior to the start of Divine Liturgy, parish acolyte Theodore P Fekula was awarded the right to wear the orarion. 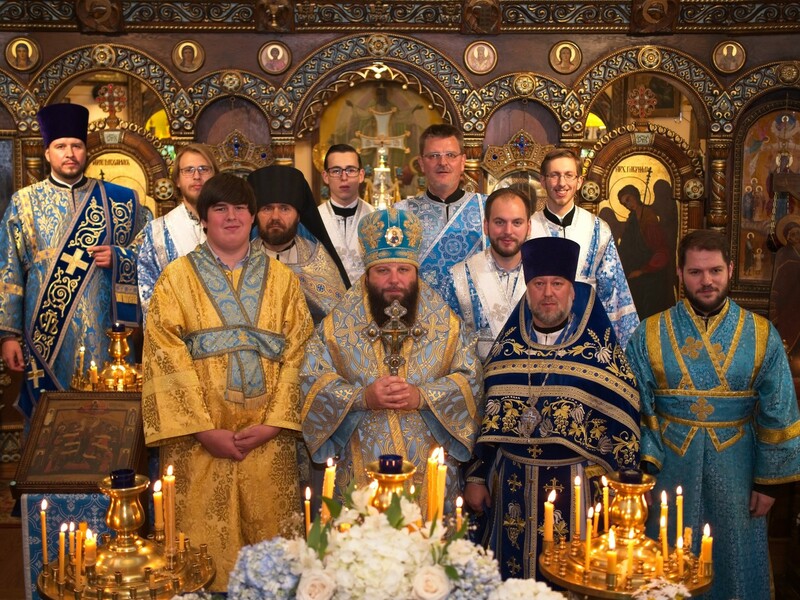 At Divine Liturgy, Bishop Nicholas was co-served by parish clergy, as well as visiting clerics from the Long Island Deanery: Archimandrite Maximos (Weimar; Abbot of St. Dionysius Monastery in St. James, NY), and with him Hierodeacon Parthenios (Miller), Fr. Eutychius, Archpriest Ion Arama (rector of Holy Annunciation Church in Flushing, NY), and Fr. Eugene Kallaur. 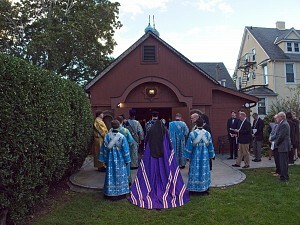 At the Little Entrance, for his dedicated service to the Holy Church, Fr. 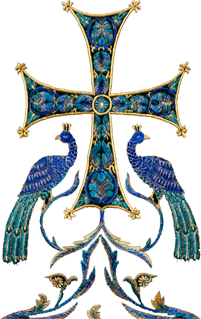 Alexandre was awarded the right to wear the jeweled cross. It was especially touching that the cross presented to Fr. Alexandre had once belonged to his father-in-law, the ever-memorable Archpriest Alexei Ohotin, and had been presented to him in honor of the 50th anniversary of his ordination as the award of a second pectoral cross. At the end of Liturgy, the festal celebrants were joined by Frs. Serafim Gan and Paul Wolkow from St. Seraphim Church, who vested and served a short moleben before the icon of the Protection of the Mother of God alongside the above-mentioned clergy. In his sermon, Bishop Nicholas underscored the role the Mother of God plays not only as a loving Mother to all Christians, but also as an image of the ideal mother, an example toward which all mothers should strive. He also called on the faithful to honor and love their own mothers, as the Savior Himself taught us in expressing love and respect toward His Holy Mother. Bishop Nicholas congratulated Fr. Alexandre, the clerics, and all of the parishioners on their patronal feast, and urged everyone to support their clergy in their labors, and to be missionaries for all by their way of life. In turn, Fr. Alexandre thanked His Grace for his archpastoral visit, prayers, and words of instruction, as well as all those who helped organize the festivities. The protodeacons intoned the Polychronion for all, and after the kissing of the Cross, all proceeded to the parish hall, where the sisterhood had prepared a bountiful festal luncheon. Holy Intercession Church was founded in 1951 in a former garage on the grounds of an old-age home, thanks to the diligent efforts of Prince Sergei & Princess Florence Beloselsky-Belozersky, parish warden Gregory Mitkevich, and Russian parishioners. In November 1951, the church was consecrated by Metropolitan Anastassy (Gribanovsky), then First Hierarch of the Russian Church Abroad. The church was adorned steadily over the course of the more than 60 years of its existence. Fr. Emmanuel (later Bishop Constantine) Essensky carved much of the wood ornamentation. Among the holy items in the parish is a reliquary with the relics of 82 of the fathers of the Kievan Caves.